Great story. He was our neighbor and Grandpa Sam’s 1st cousin. Thanks for all your work. 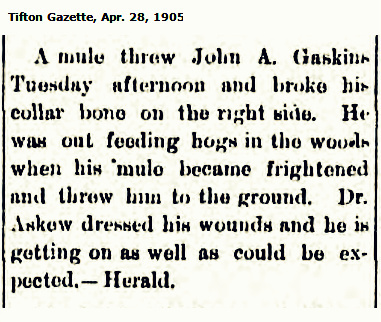 Too easy to forget how dangerous mules can be. 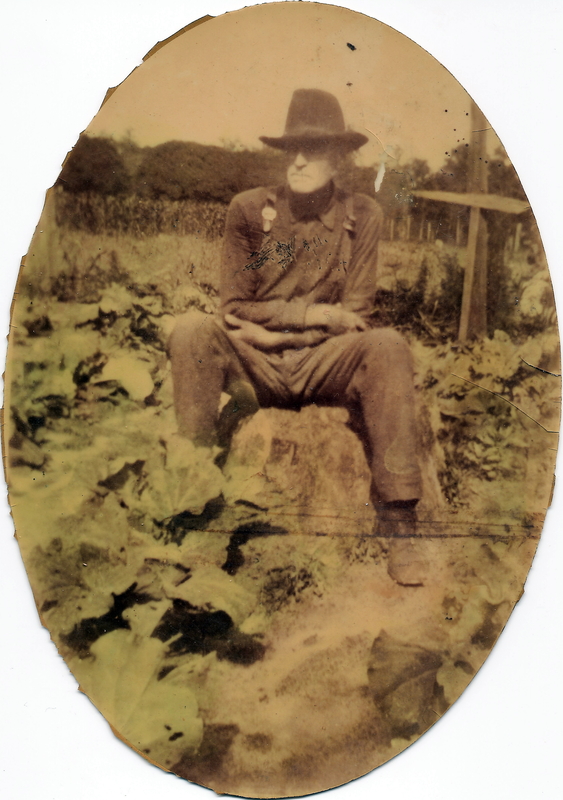 My grandfather L.G. Outlaw’s brother was kicked and the paper reported that he was not expected to live, but as we all know, Joe did live. I would like to add my gratitude to that of Bill Outlaw. I am indeed thankful for all you do. Evon, Thanks for reading the Ray City History Blog. I’m glad you enjoyed this post. 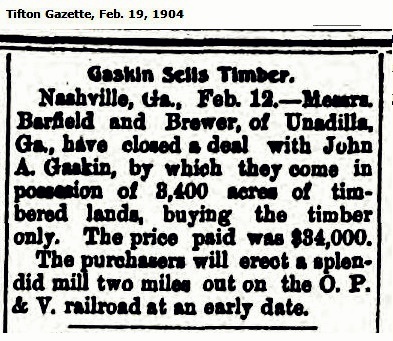 The Gaskins family has certainly provided some interesting contributions to Berrien County history. Thanks, Bill. When I was a barefoot young boy visiting my uncle Walter Brantley at his farm near Ray City, I was always interested in going down to the barn. I wanted to see the farm equipment and the mule. One day I was down there by myself “petting” that mule and he stepped on my foot. Needless to say there was some yelling and hide pounding, but nothing I did would induce that mule to move. Finally, he lifted his leg and I yanked my foot out. Fortunately, the soil under that old barn was so dry and soft powdered that my foot had sunk into it under the weight of the mule. Nothing was broken – I escaped with only a blackened toenail. But I had a lot more respect for mules after that.